Compared to enamelware ceramics of the K'ang-hsi reign (1662-1722), official wares of the following Yung-cheng reign developed gradually in a more painterly direction in terms of the surface decoration of vessels. The color of the base increasingly was replaced by white glaze, with enamelware painters often treating the plain white surface of the vessel like blank paper or silk in doing a painting. Whether it was court painters actually taking up the brush themselves to create images or just providing drafts for craftsmen to copy in producing ceramics, the pursuit of imitating the elegant pastimes of painting and calligraphy practiced by literati resulted in images on enamelware porcelains becoming increasingly refined and delicate, fully reaching the level of art practiced in the Painting Academy. This piece has a flaring mouth and a narrow lip, the deep arc of the body resting on a short base stem. 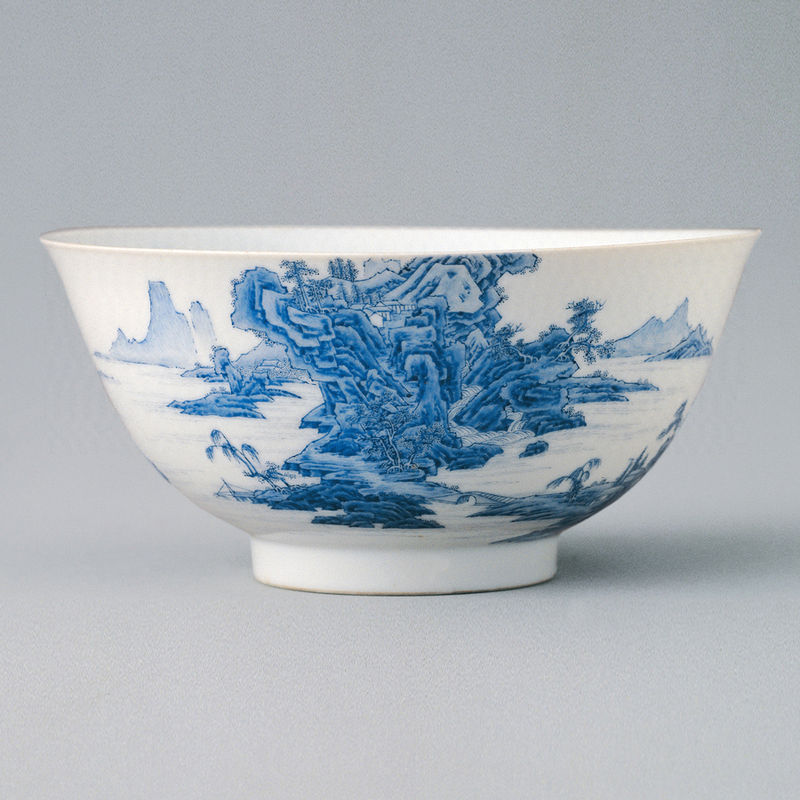 Painted on the white glaze of the thin porcelain is a landscape in blue on one side, in which the features of the mountains were rendered with fine brush strokes to bring out the sense of volume and depth suggested by the varying tones of the pigment washes. The moss dots further solidify the mountaintops, and to the side are tree, boat, and cottage motifs all marvelously rendered. These all serve the function of providing pleasure for the viewer in appreciating the scenery. On the other side of the vessel is an inscription that reads, "Floating in the hazy mist on the green waters of the river, the blue mountains on either bank press on the emerald waves." Both before and after the inscription are three seals painted in red pigment that read, "Shou-ju (Longevity as Such)", "Shan-kao (Mountains High)", and "Shui-ch'ang (Waters long)". In the center of the plain white bottom is an inscription in blue that reads, "Made in the Yung-cheng Reign", appearing as four characters in Sung style script.